Bowling Green Glass custom mirror walls can significantly enhance your home by creating an immediate visual impact. 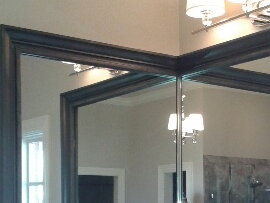 We can help create a specific design and install your mirror quickly. The finished design can shape, expand, accent or lighten any room, regardless of size or architectural configuration. We also offer beveled mirror and mirror with an added beveled frame for an even extra “wow” factor. Custom mirrors with pattern cut edges are also available at Bowling Green Glass. To go the extra mile in custom mirrors, ask about our distinctive etched glass and mirrors for home decor as well as unique personalized etched gifts.Our in-house artist will work with you personally to develop a unique design to perfectly fit your life.